According to the testimonies acquired by Addameer, eight forms of abuse were identified at the facility: positional torture such as “stress positions”; beatings during interrogation; isolation/solitary confinement, sleep deprivation and long interrogation, threats to family members, being subjected to sounds of torture, deliberate medical neglect, and screaming and cursing. More than half of those surveyed reported being held in stress positions; one 18-year-old former prisoner was held in a stress position for eight hours a day, for 18 days. A third of prisoners reported being beaten, while a fifth of individuals were subjected to violent shaking. Addameer noted that “children are no exception when it comes to mistreatment and intimidation”, with 47.8 per cent reporting “that they were beaten during their arrest”, 45.5 per cent experiencing positional torture during interrogation, and 40.9 per cent “threatened with the potentially injuring of their families if they did not cooperate”. According to the rights group, “the primary conclusion that the above research and indicators provide is that mistreatment, and coercion, amounting to torture, are commonplace and systematic within the occupation’s interrogation systems”. Addameer added that “as a result of torture’s status in international law, the international community has a distinct responsibility to take action to sanction the perpetrating entity”, urging “the international community to begin sanctioning the occupier for its crimes”. Israeli forces opened fire during a demonstration in the southern Gaza Strip on Wednesday, killing a Palestinian youth, the Palestinian health ministry said, Reuters reports. 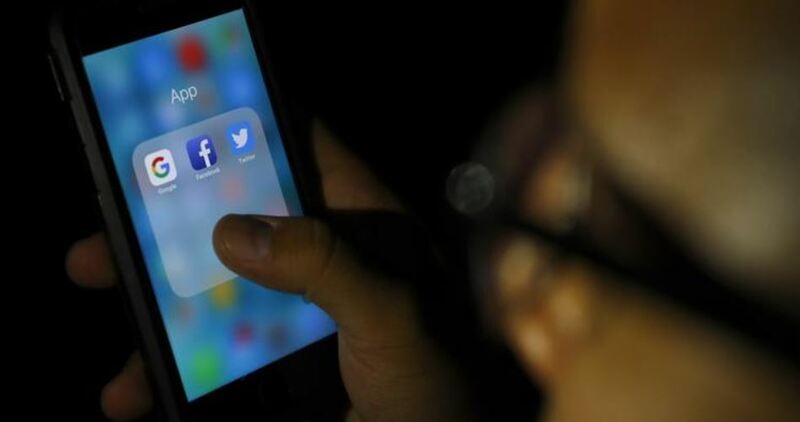 An Israeli military spokeswoman said she had no knowledge of the incident, initially. The border between Gaza and Israel has been the scene of weekly Palestinian demonstrations since March 30 and recently, protests have taken place late at night, as was the case on Wednesday. The Israeli military said earlier that during the day there had been several incidents along the Gaza-Israel border “with the participation of hundreds of rioters” who rolled burning tyres and hurled firebombs and rocks at soldiers. It said there were no Israeli casualties. Israel withdrew its troops and settlers from Gaza in 2005 but maintains tight control of its land and sea borders and has fought three wars there in the past decade against Hamas Islamist militants that control the territory. With Egypt, Israel has imposed a blockade that the World Bank says has brought Gaza’s economy to a crisis, leaving its 2 million people with limited access to health care, clean water and electricity. The international human rights group warned that “several of these incidents appear to involve deliberate and wilful killing of unarmed civilians and may amount to war crimes”, and also renewed its call for an arms embargo to be imposed on Israel. The deaths of six Palestinians within just 24 hours is a horrific demonstration of the unnecessary or excessive force deployed by Israeli forces against Palestinian civilians in the Occupied Palestinian Territories (OPT). Palestinian Authority President Mahmoud Abbas is believed to be preparing to cut all funding to the Gaza Strip in an effort to end the power struggle between his Fatah movement and rival faction Hamas, after reconciliation efforts failed, anonymous sources in Ramallah have revealed. According to Asharq Al-Awsat, Fatah officials have rejected Hamas’s demands to retain security control over the Gaza Strip and collect taxes there, along with a deal that would see the government absorb tens of thousands of Hamas employees. Earlier this week, a senior Fatah delegation met with Egyptian Foreign Minister Sameh Shoukry and intelligence officials in Cairo to discuss the ongoing tensions between the PA and Hamas. Egypt has attempted to broker a reconciliation deal between the two factions, but has so far failed to reach an agreement. Senior Fatah member Azzam Al-Ahmad, who was leading the delegation, told reporters that for the PA, ending the Fatah-Hamas rift and achieving national unity was an important factor in “thwarting Israeli schemes” against the Palestinians. Such apparent concern for all Palestinians, including those in Gaza, has not been obvious on the ground, with the PA under Abbas imposing its own punitive measures against the people in the besieged enclave since April last year. Talks between the Palestinian factions have stalled in recent months. Although Fatah and Hamas signed an agreement in Cairo last year in an attempt to advance reconciliation efforts and restore the PA’s governing authority in Gaza, they failed to make progress in the aftermath of US President Donald Trump’s recognition of Jerusalem as Israel’s capital. Relations got worse following the attempted assassination of PA Prime Minister Rami Hamdallah during a trip to Gaza in March for which the PA blamed Hamas; the resistance movement denied the allegation. The three men identified by Hamas as suspects involved in the bombing were later killed in a shootout with its forces in Gaza on 22 March. In recent weeks, the PA has condemned Hamas for conducting indirect talks with Israel on reaching a new truce agreement in the Gaza Strip, arguing that only the Palestinian Liberation Organisation (PLO) has the authority to negotiate with Israel as the legitimate representative of the Palestinian people. In a speech on Tuesday, Hamas leader Ismail Haniyeh accused the PA of hindering efforts to end the dispute. “Fatah’s demand that it assume control over everything in the Gaza Strip is making it difficult to achieve progress,” he explained, adding that the movement would not accept having to pay any political price for negotiating with Israel for an end to the blockade imposed on the enclave. The PA has threatened to sever security cooperation with Israel if the blockade on the Gaza Strip is lifted. It is seeking to exploit the situation to put pressure on Hamas into handing over control of the coastal territory. The PA is currently battling against the US and Israel, as the Trump administration prepares to release the second edition of the “deal of the century”. Abbas has invited Middle East envoys, foreign ministers and UN Security Council diplomats to a meeting in New York next week, prior to the UN General Assembly, to discuss prospects for peace. It is an effort to garner support against the Trump peace plan, which is not believed to recognise a Palestinian state. GAZA, PALESTINOW.COM — Israeli soldiers on Wednesday night killed a Palestinian teenager and wounded others as they were rallying in a border area to the east of Rafah in southern Gaza. A Palestinian reporter said that the kid was critically injured in the head by Israeli gunfire and succumbed to his injury later. 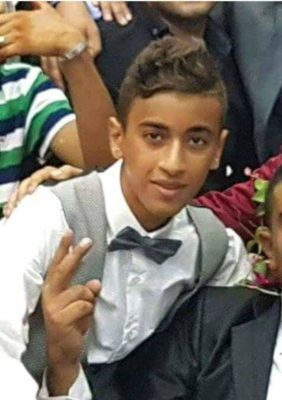 Local sources identified the victim as 15-year-old Mu’men Abu Aiyada. Three other young men also suffered bullet injuries during their participation in the protest, which was held against the Israeli occupation in Rafah last night. Israeli occupation forces kidnapped on Thursday at dawn Palestinian man, his wife and his son in the Palestinian city of Al-Khalil in the south of the occupied West Bank. An Israeli military unit, an eyewitness said, raided the house of the Palestinian citizen Jamal Karameh, inspected it and damaged much of its furniture. The eyewitness said that the Israeli occupation kidnapped Karameh, his wife Hanaa and their son Jamil. They violently beat them and took them to an unknown place. Israeli army frequently conducts sweeping kidnapping campaigns across the occupied West Bank on the pretext of searching for “wanted” Palestinians. According to Palestinian figures, some 6,500 Palestinians are currently languishing in Israeli prisons, including scores of women, roughly 350 minors, and at least six members of the Palestinian Legislative Council. Israeli forces caused, Thursday, many Palestinians to suffer the effects of teargas inhalation, after dozens of soldiers invaded Shu’fat refugee camp, in occupied East Jerusalem, imposed fines on various stores and ticketed many cars, leading to protests. Media sources said a large military force, accompanied by the police, invaded the refugee camp, and provocatively drove in its streets. They added that the soldiers then issued fines against many stores in the refugee camp, while the police ticketed many cars. Many youngsters protested the invasion and hurled stones at the invading soldiers, while the army fire many gas bombs, and rubber-coated steel bullets. Medical sources said that many Palestinians suffered the effects of teargas inhalation, and received the needed treatment. Israeli soldiers killed, on Wednesday night, a Palestinian child from Rafah, in the southern part of the Gaza Strip, and injured many Palestinians in several parts of the coastal region. The Health Ministry in Gaza said the soldiers killed Mo’men Ibrahim Abu Eyada, 15, from Rafah, after shooting him with a live round in the head, east of the city. Furthermore, the soldiers fired dozens of live rounds, and high-velocity gas bombs, at Palestinian protesters near the perimeter fence, east of Deir al-Balah, in central Gaza, wounding six Palestinians with live fire, and causing many to suffer the effects of teargas inhalation. 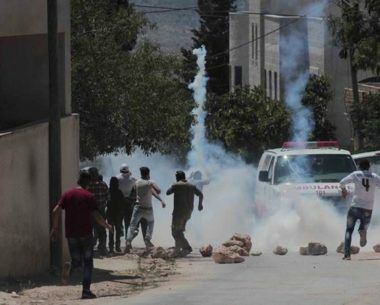 The two Palestinians were rushed to the Al-Aqsa Hospital in Deir al-Balah, while the medics provided the needed treatment to scores of Palestinians who suffered the effects of teargas inhalation, in addition to various cuts and bruises. Also on Wednesday, the soldiers abducted two young Palestinian men after they crossed the perimeter fence, in southern Gaza, and moved them to an interrogation facility. On Tuesday, the soldiers killed four Palestinians, at dawn and during evening hours, east of Khan Younis, and near Beit Hanoun (Erez) Terminal in northern Gaza, and injured dozens of residents with live fire, in addition firing many gas bombs and concussion grenades causing many to suffer the effects of teargas inhalation. The slain Palestinians have been identified as Ahmad Mohammad Mohsin Omar, 20, from the al-Shati’ refugee camp in northern Gaza, Mohammad Ahmad Abu Naji, 34, from Jabalia in northern Gaza, in addition to Naji Jamil Abu ‘Aassi, 18, and Ala’ Ziad Abu ‘Aassi, 21, from Khan Younis. The Health ministry in Gaza said Ahmad Omar and Mohammad Abu Naji, were killed on Tuesday evening, by Israeli army sharpshooters during a protest, against cutting UNRWA funding, near Eretz (Beit Hanoun) Crossing, in northern Gaza. It added that Naji and Ala’ were killed at dawn, after an Israeli war jet fired a missile at them, east of Khan Younis. Also on Tuesday, the soldiers killed Mohammad Yousef Sha’ban Oleyyan, 26, in the al-Misrara area, in occupied East Jerusalem, after he reportedly attempted to stab soldiers, and Mohammad Zaghloul al-Khatib, 24, was beaten to death by Israeli soldiers who invaded his home, in Beit Rima town northwest of Ramallah, in central West Bank, while he was sleeping at dawn.